Ann Darr, one of the premier poets in Washington, D.C., died on December 2nd. Born in Bagley, Iowa in 1920, Ann graduated from the University of Iowa in 1941, then headed out of the Midwest for New York where she worked for NBC radio as a writer and broadcaster for The Women of Tomorrow. 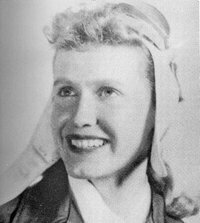 With the onset of WWII, she joined the Women Airforce Service Pilots, or WASPs, and was stationed in Sweetwater, Texas. As she later wrote in "Orders," "After I ran away from home and came back again, my Papa said go if you must but mind three things: stay away from water, stay off of boats, and don't go up in an aeroplane. So first I learned to swim, then I learned to sail, and then I learned to fly." While more than 25,000 women signed up for the WASPs, only 1,074 earned wings, Ann among them. She herself flew every kind of plane, e.g., B-26s at the gunnery school near Las Vegas, while gunners in B-17s fired live ammunition at the target she was towing. WASPs flew over 60 million miles in every aircraft the Air Force had: small trainers, B-26s, B-17s, UC-78s, P-51 fighters, and the B-29 Super Fortress. By the time the WASPs were disbanded on December 20, 1944, 38 of the pilots died in airplane crashes. In commemoration of the WWII Memorial Ann wrote an article for The New York Times Magazine, May 7, 1995, "The Women Who Flew - but Kept Silent" and for U.S. News and World Reports: "The Long Flight Home: Women Served and Died in WWII". Now they are remembered." 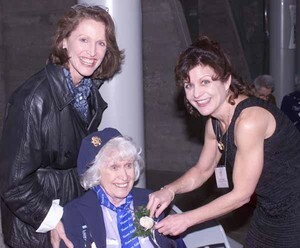 Her collection of poems, Flying the Zuni Mountains (1994) is "dedicated to all Women Pilots particularly to the WASP members of 44-W-3 on this, the 50th anniversary year of our graduation, receiving of our wings." Read the title poem. The mind is a violence from within protecting us from a violence without. It is the imagination pressing back against the pressure of reality. It seems, in the last analysis, to have something to do with our self-expression: and that, no doubt, is why the expression of it, the sound of its words, helps us to live our lives. While flying is subject matter in numbers of poems, at a deeper level flight calls up images and metaphors that are infused in the way Ann's poems often create her experience. As she writes, "There is a part of me that looks/ forever for a level land,/ where rows of grain run/ straight way to the wind." Her poems sometimes look back over the significance of events in the past Her themes are elemental â€” loss, violence, anger, fear, love and death. Here are just two. First, "The Gift." and given back to you. You will need it. I had hoped there was some other way. which belonged to my mother's mother's mother's . . .
just to celebrate, but my skirt wouldn't fit. the light in my lover's eye, anywhere. do I think I'm doing. I am this artist, see? not. Somewhere there is a leak in systems. In 1978, Dryad Press published Cleared for Landing, Ann's third book. Designed by Susan Foster, it includes paintings that Susan did in response to Ann's poetry. The title poem, "Cleared for Landing, Cleared for Approach" gives voice to the inexplicable sense of responsibility that Ann's narrator - herself - felt as the plane slammed into Weather Mountain. In her 70's Ann toured Western Europe with other artists, writers, and musicians as a member of Point-Counter Point, a large river barge that would travel from city to city, dock, and then put on a day of cultural exchange with local citizens. Ann once wrote to a friend what she wanted on her tombstone: "Late in life she ran away from home and joined the circus." In her poetry readings Ann criss-crossed the world from the Kennedy Center in Washington, D.C. to Prague, Czechoslovakia. She taught creative writing up until the age of 80 at American University in Washington, D.C., the Writer's Center in Bethesda, Maryland, and other universities. She and her husband Dr. George Darr divorced long after raising a family in Chevy Chase, Maryland. Linda Pastan, "For Ann at the Air and Space Museum"
Ann was stricken with Alzheimers and lived in nursing homes near her daughters in Portsmouth, New Hampshire, and Chicago, Illinois over the past six years. She is survived by her three daughters: Dr. Elizabeth Darr, Worcester, Massachusetts, Deborah Darr (Kevin Shanley), Chicago, Illinois, and Shannon Darr-Longstaff, Eliot, Maine; grandchildren: Judson Lester, Vera Lester, Travis Longstaff, Taygra Longstaff, and many other great friends and relatives. A memorial service will be held at Arlington National Cemetery in the spring.